This Southern Hoppin’ John Recipe is the best Hoppin’ John Dish you will ever make. 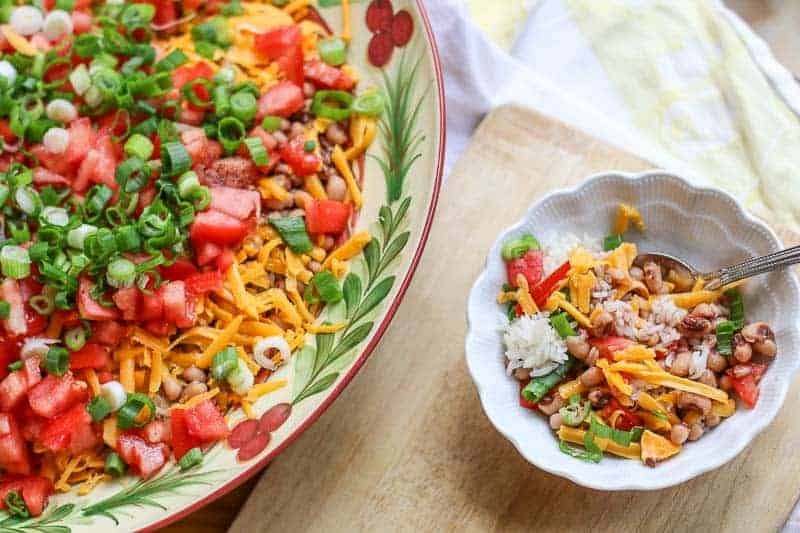 I layer black-eyed peas over rice and top them with cheddar cheese, tomatoes, and green onions. The result is beautiful perfection! 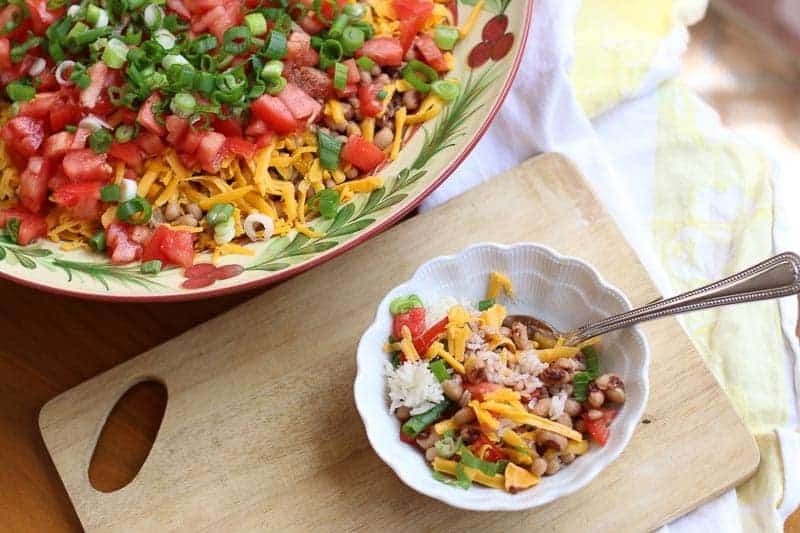 This Southern Hoppin’ John Recipe is colorful, easy, and absolutely incredible. 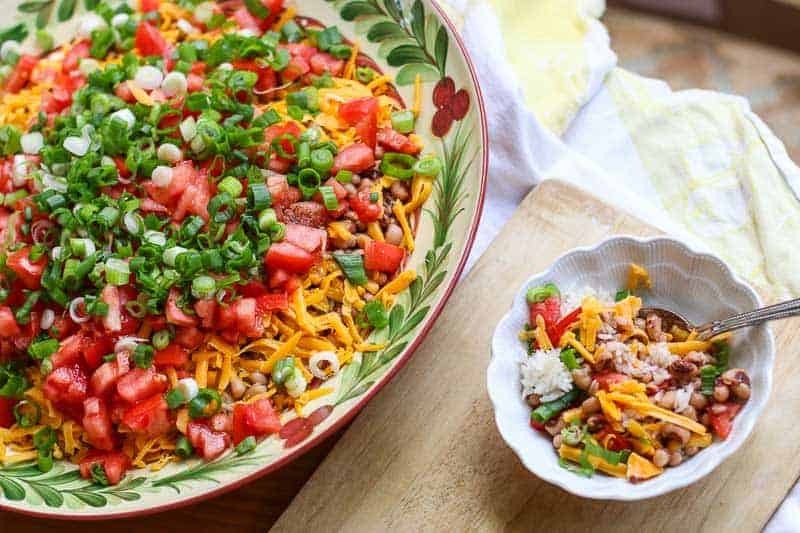 This is a staple dish for my cookouts and family gatherings and everyone always returns for a plate of more. Now for this particular dish, I used canned Black-eyed peas. To some that is blasphemy…. And I would agree if they were served solo. But after simmering them in bacon fat or a vegetable boullion (for the vegetarians), and adding the toppings; no one will know they aren’t homemade…. I promise. So keep it simple. Make them easy. This is an opportunity to cut corners. They are going to be soooooo good. You will thank me! However, if you would like to make the black eye peas from scratch you are more than welcome to. Here is a recipe. 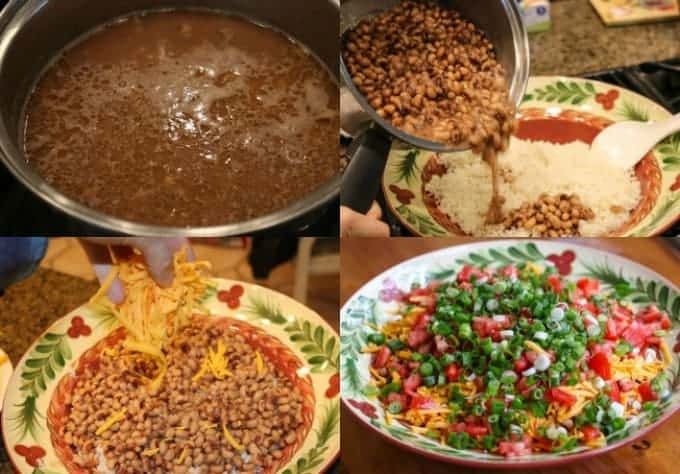 Next you are going to layer those black-eye peas with all it’s flavorful liquid over cooked rice. to cook all of my rice. It is one of my favorite kitchen gadgets. My rice comes out perfect every time. Then you shred cheese. I did say shred… This is NOT a corner to cut. That pre-shredded cheese is NOT as moist and tasty as freshly shredded cheese. It takes 5 minutes. Do it! You will sprinkle the cheese all over those black-eye peas…. Then you add your freshly cut sun ripened tomatoes and green onions. If you don’t have any wimps at your dinner table, add on a thinly sliced and diced jalapeño. If you do have those that can’t take the heat, have some diced jalapeño set to the side. If you want, you could eat this all by itself… I wish you could taste this Hoppin’ John Dish right now…. I would share if I could! If you like this recipe, check out: Easy Southern Banana Pudding , Carolina Barbecue Sauce, and How to Cook Field Peas. This Southern Hoppin' John Recipe is the best black eye pea dish you will ever make! It is served over rice and topped with cheese, tomatoes, onions, and a jalapeno. Meanwhile, cook canned black-eyed peas in their liquid with either the bacon fat or bouillon for 20 minutes on a low simmer. Layer black-eyed peas over cooked rice. 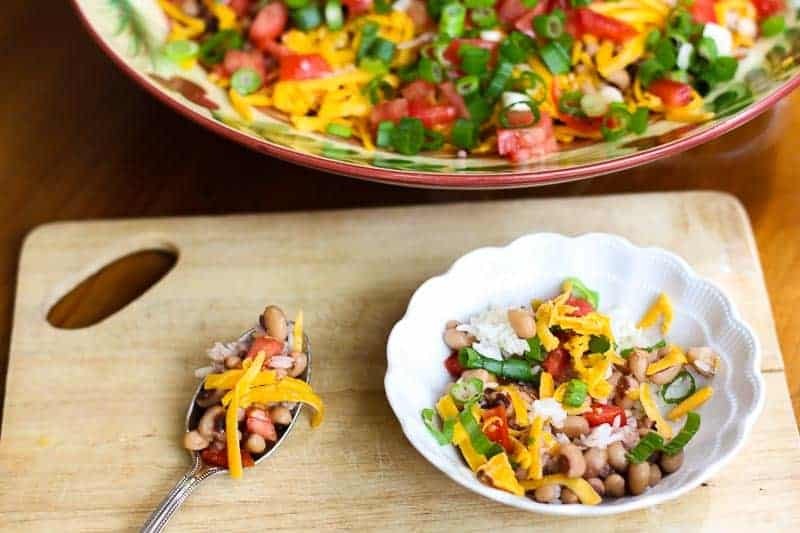 Layer cheese over black-eyed peas. Layer green onions over tomatoes. Layer jalapeño over green onions. I love black-eyed peas. This dish is not served often enough for my liking. Can’t wait to try your recipe! That is the most colorful bowl of Hoppin John that I have ever seen. I find nothing wrong with using canned beans for lots of applications! They are so much quicker than dried! I am really enjoying this recipe! So many colors, it looks so fresh, I would eat it on its own! This recipe looks soo divine – vibrant and soo inviting – such a versatile side dish or a meal on its own. Perfect! Thank you soo much for sharing this absolutely cheering recipe – love the combo and all the ingredients in this – a must make as soon as. I can’t wait to try this recipe out. It looks so delicious. And it’s a perfect side dish for so many different meals. Katie, I made this tonight for friends and it was a huge hit! Since I cooked bacon for the hoppin John, we had BLTs as well. It was super easy and really tasty! I will definitely make it again! I’m a big proponent of shredding my own cheese too! I have a T-Fal electric shredder. It’s amazing! Good recip! 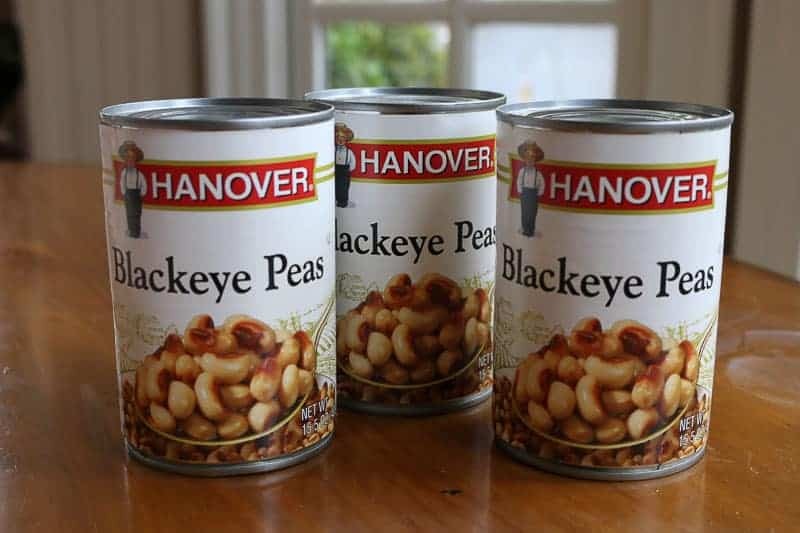 Just need to find blackeyed peas in China! 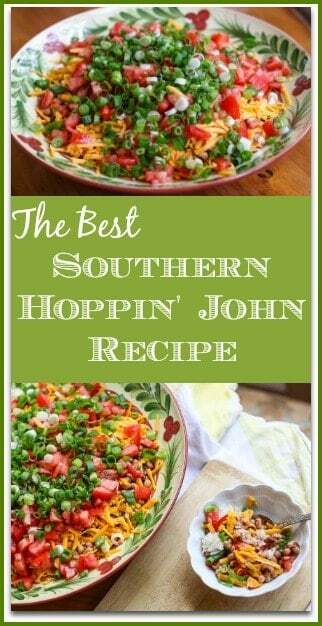 I’ve never had southern hoppin john, but this looks awesome….definitely something I would love. 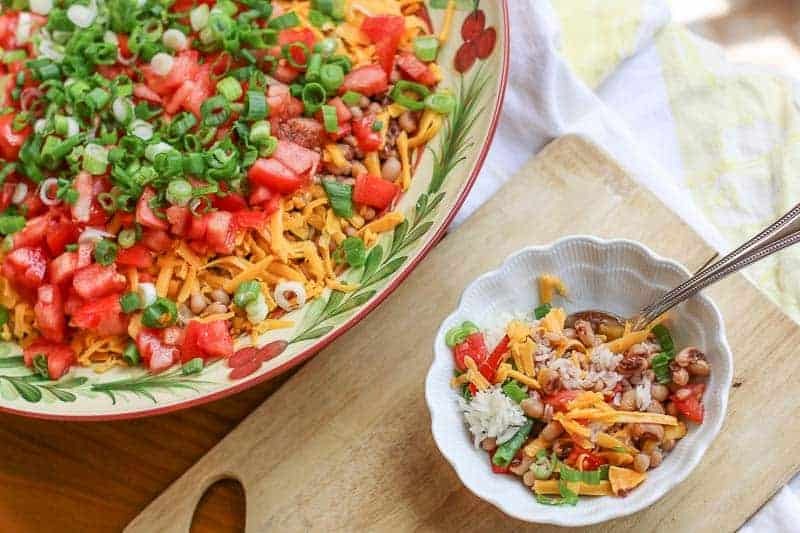 I’m a huge fan of beans and then add all that cheese, bacon and green onion? Yum! Pinning for making soon 🙂 Thanks for sharing, girl! This looks so bright, colorful and delicious! Totally a must make summer time dish 🙂 Love the name, too! I’m right with you on canned beans – total time saver and I use them more often than not. This does look good! I’ve never had Hoppin John, but it looks like all the stuff that I love! An I with you on the cheese….always hand shredded as needed and it always makes food taste extra delicious! Such a Southern classic! I love this dish and I love your take on it! I totally agree with you that a. canned beans can absolutely be substituted here and b. cheese should always be shredded by hand and not bought that way in the bag. Love your layers and I would definitely be happy to tuck into a big bowl of this all by itself! Oh Katie, this looks fantastic!! Great timing too because we don`t get black eyed peas down here very often but I found some last week & they`re begging to get used. Having a Bbq this weekend & your recipe is just perfect!